Relax in style! Take a break at our beautifully appointed Treehouse in East Texas. Treehouse is located in a forested section of a 135 acre ranch. It is a cozy upstairs getaway with a queen bed, sitting area, full kitchen and bath with commanding views of the 8 acre lake below. Situated on the second floor of the owner's detached carriage house, Treehouse offers a private deck where guests can sit and take in spectacular views of the lake. It features windows, windows and more windows opening to the surrounding woods and hence, the tree house feel. The Treehouse includes a private deck overlooking the 8 acre private lake and woodlands below and a private stone patio with gas grill. Accommodations at Treehouse are first class and include upscale bedding and sheets. Satellite TV with DVD library and a DSL hook-up let you reconnect with the world outside if desired. A picnic table and gas grill sit on a large dock out in the lake and make for a wonderful dining experience just a short walk from Treehouse. Guests can hike and picnic throughout the 135 acre ranch. Because the ranch sits between two vegetation zones, it is a great area for birdwatching. For those who enjoy fishing, the lake behind Treehouse is stocked with Florida bass, bream and catfish. Guests can also fish on a variety of fully stocked lakes/ponds throughout the property. All fishing is catch and release to ensure our fishing remains good for future guests. Each has a dock and most have boats and/or canoes for getting out on the lake. Please note that swimming is strictly prohibited. The pygmy goat herd is also a great hit... especially if there are baby goats to pet. Located within 15 minutes of Pittsburg, Gilmer and Winnsboro, guests can experience life in the country but also enjoy the amenities of a town. In the Summer, fresh peaches, blackberries and blue berries are sold at nearby orchards. Golfing, a winery and a variety of restaurants are within 15 minutes of the ranch. There is also a SPA in nearby Winnsboro for those who want to pamper themselves while visiting. For antique shoppers, there are many shops within 15 to 30 minutes of the ranch. Jim and Paula Archer own and operate Lone Star Cattle Company, a working 110 acre ranch in Northeast Texas. Jim is a retired Professor of Chemistry and Paula is a retired software sales representative. They moved to the ranch 20 years ago. Jim serves on the college foundation board. He is a past District Governor for Rotary International and continues to serve actively in that organization. He is also Chair of the local ambulance board. Paula gardens, makes jam and other goodies from the fruits and vegetables she grows and also makes wine for her own enjoyment. She has a flock of chickens which provide fresh eggs for the family and extras for purchase by friends and ranch guests. Jim and Paula enjoy sharing the relaxation and enjoyment of the ranch through the vacation rental program. We love the beauty of the area and the wonderful community of small town friends and neighbors. We moved to East Texas more than 20 years ago. After living in town (Pittsburg TX) for 10 years we bought the ranch and fixed up Pine Grove Cottage for our weekend getaway. We loved staying there so much we sold our home in the city and moved to Pine Grove Cottage while we began plans for a new home on another corner of the property. During this time we needed more room for family and friends so we added Spring House on still another corner of the ranch. In 2005 our home was completed and we moved out of Pine Grove Cottage. We decided to offer both Pine Grove and Spring House on VRBO at that time so others could share in the beauty and fun of the ranch. We were so pleased with the wonderful guests that visited, we have added Treehouse and a Bed & Breakfast to allow larger groups to stay. We often host extended families looking for a retreat, wedding parties and multiple families who want to come together to visit. Now we can accommodate all but each property can have its own privacy. Our return rate is very high so many of our guests have come to view the ranch as their own special place in the country...without all the hard work! A stay at the ranch is a chance to step away from the stress and demands of everyday life and truly relax. The ranch provides a great opportunity to enjoy the out of doors and the seasons. With woodlands and lakes throughout a wide variety of birds and wildlife can be spotted. Fishing on one of the many ponds throughout the property is a great way to relax. On the other hand, all the adventures of Northeast Texas are just a short drive away as we are located in the heart of the area and only a 10 to 15 minute drive to 3 nearby towns: Pittsburg, Winnsboro and Gilmer. Treehouse is in the middle of a 130+ acre working ranch. Treehouse overlooks an 8 acre fully stocked private lake. Telephone is enabled for all incoming calls and for local outgoing calls plus outgoing calls to toll free numbers (800, 888, etc). Long distance outgoing thru guest provided carrier calling card. Guests staying for a week or more can obtain access to washing machine and dryer at a nearby building on the ranch. Sitting area with couch, lounge chair/ottoman, coffee table and TV. Coffee maker is a drip coffee maker suitable for loose ground coffee. We do supply coffee filter packs (caffeinated and decaffeinated). We also provide filters if you wish to bring your own coffee. A table for two is provided inside and another table for two is on the private deck outside. Deck of cards and puzzles. Small DVD music library provided. Large lawn area adjacent to the dock is available for guests to enjoy with fire pit and picnic table. Private Balcony/deck with table and chairs overlooking the 8 acre pond below. Boats and paddles are provided at no additional charge. 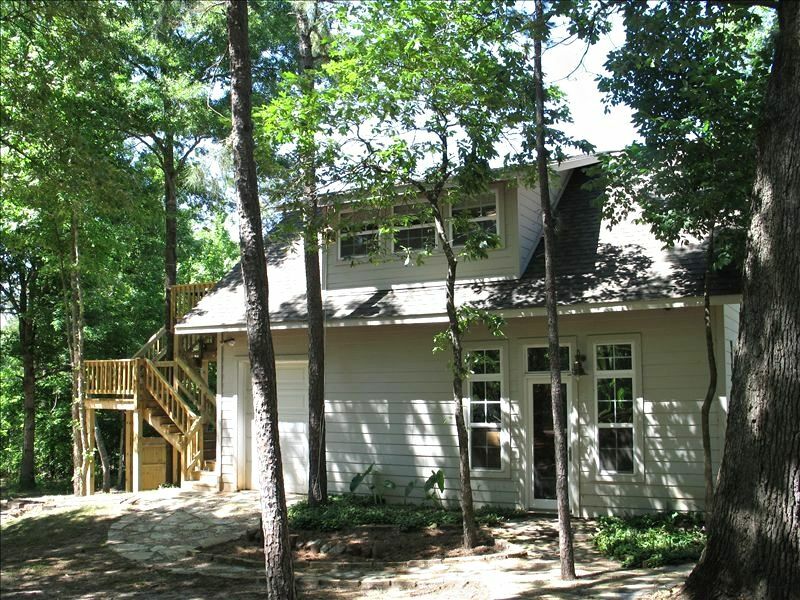 Private deck overlooks private 8 acre lake and is nestled in the trees surrounding Treehouse. In addition, there is a private stone patio in the yard below Treehouse where a gas grill is located. Treehouse is best suited to adult guests. Please note that the total number of guests is allowed is 2 and that number includes children. This property is not suitable for children under 12. Great fishing venue as lake behind Treehouse is stocked with Large Mouth Florida bass, bream and catfish. The record bass catch for this pond is 15 lbs. All fishing is catch and release only. Had a fun time fishing even though it was windy we caught about 20 bass. No worries,that was a fish nibbling! Love getting away from it all and just dropping a line in the water. Spending time with your husband of 30yrs and still finding out funny stories about his or your childhood then laughing till your tummy hurts. That what it's all about. This is a wonderful place to go relax and fish. The owner's are great. This is the 3rd time we have stayed at cabins here. It is now our favorite place to get away from it all. The Treehouse never disappoints. Paula and Jim are perfect hosts. We’ll go back again and again!! A wonderful place for fishing and relaxing! The tree house was perfect for me and my husband. We caught many fish even though it was cold and saw some deer also. We met Paula and she is so kind! We will definitely be back again!!! Treehouse is on a 130+ acre ranch. Rates are subject to change until confirmed. 6% Tax applied to all stays. Weekday rates apply only for stays from Monday thru Thursday nights and for non-holiday stays. Heavily Discounted Monthly Snowbird rates available for January and February. Please request rates from owner.